You can't make a perfectly accurate map, as Jorge Luis Borges so succinctly told us, without making it the exact same size and shape as the land it portrays. But given the utter uselessness of such an enormous piece of paper (which so frustrated the citizens of the imaginary empire in Borges' story that, "not without some pitilessness," they tossed theirs into the desert), no mapmaker would ever want to. A more compact map is a more useful one; unfortunately, a more compact map is also, by its very nature, a less accurate one. 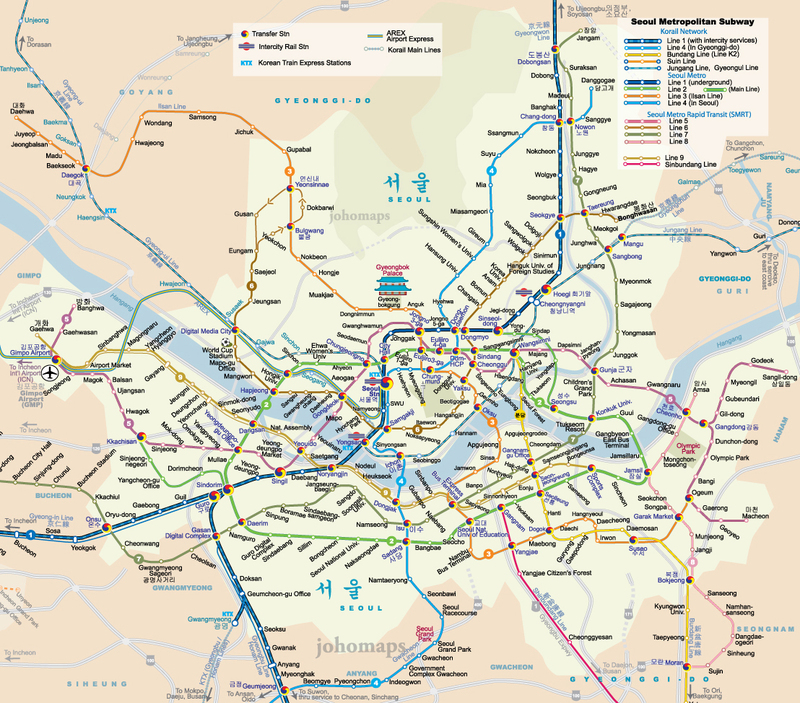 The same rule applies to maps of all kinds, and especially to transit maps, quite possibly the most useful specialized maps we consult today. They show us how to navigate cities, and yet their clean, bold lines, sometimes turning but never wavering, hardly represent those cities — subject as they are to variations in terrain and density, as well as centuries of unplannably organic growth — with geographical faithfulness. One can't help but wonder just how each urban transit map, some of them beloved works of design, strikes the usefulness-faithfulness balance. Living in Seoul, I've grown used to the city's standard subway map. I thus get a kick out of scrutinizing the more geographically accurate one, which overlays the train lines onto an existing map of the city, posted on some station platforms. It reveals the truth that some lines are shorter than they look on the standard map, some are much longer, and none cut quite as clean a path through the city as they seem to. At Twisted Sifter you'll find a GIF gallery of 15 standard subway maps that morph into more geographically faithful equivalents, a vivid demonstration of just how much transit map designers need to twist, squeeze, and simplify an urban landscape to produce something legible at a glance. All of those animations, just five of which you see in this post, come from the subreddit Data Is Beautiful, a realm populated by enthusiasts of the visual display of quantitative information — enthusiasts so enthusiastic that many of them create innovative data visualizations like these by themselves. According to their creations, subway maps, like that of New York City's venerable system, do relatively little to distort the city; others, like Tokyo's, look nearly unrecognizable when made to conform to geography. Even the maps of new and incomplete transit networks do a number on the real shape and direction of their paths: the map of Austin, Texas' Capital MetroRail, for instance, straightens a somewhat zig-zaggy northeast-southwest track into a single horizontal line. It may take a few generations before Austin's "system" develops into one extensive and complex enough to inspire one of the great transit maps (the ranks, for example, of "The Wonderground Map of London Town"). But I wouldn't count out the possibility: the more fully cities realize their public-transit potential, the more opportunity opens up for the advancement of the subway mapmaker's art. See all 15 of the subway GIFs at Twisted Sifter.